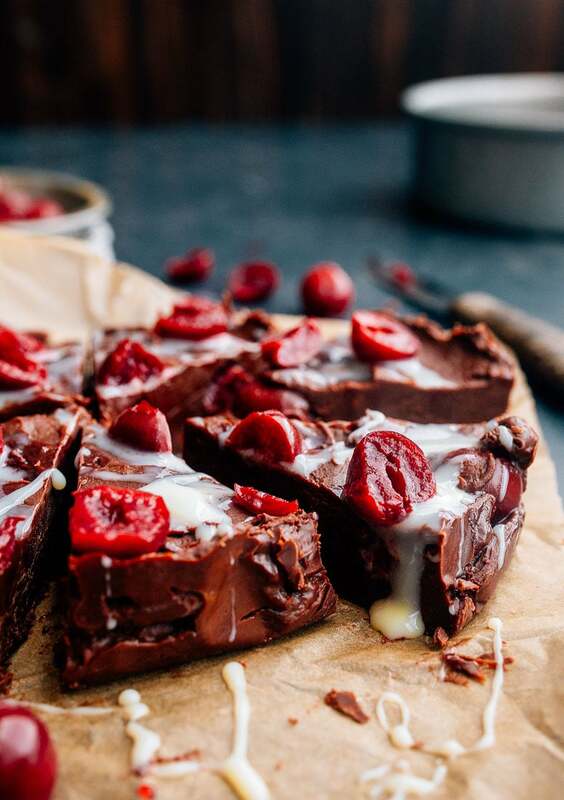 Chocolate covered cherry fudge, a small batch of fudge for two made with just 3 ingredients! Just as we were finally done with the Thanksgiving dishes and sinking into the couch to put our feet up, my Mom realizes that the only thing missing from Thanksgiving dinner this year was Christmas Fudge. And I’m sitting there, scratching my head, trying to remember if we really start holiday baking before we’ve had a chance to finish the turkey leftovers? It’s a bit of a sugar haze looking back over the years, but I think we do actually make and eat 3 different types of Thanksgiving pie (coconut pumpkin pie, pecan pie, and a cherry cheesecake in a loaf pan! ), and start with the Christmas baking in November, too! In our family, we’re over-the-top in the dessert department. You might have guessed as much. We also have a tradition of baking another pumpkin pie the day after Thanksgiving, but now we’re just sounding crazy. I created this easy 3-ingredient fudge recipe in partnership with Eagle Brand Sweetened Condensed Milk as part of their “uncookie” exchange. An “UnCookie” exchange is a way to impress friends and family with delicious baked treats that are not your typical cookie. And in our case, the treat is even easier than baking cookies! As I mentioned in my chocolate caramel cookie bars, sweetened condensed milk is just milk from which the water has been removed and sugar has been added. And since fudge needs milk and sugar, it’s a great shortcut. I based this recipe for 3-ingredient chocolate covered cherry fudge on my base recipe for a small batch of fudge, and with each sweet bite, I have a hard time understanding why anyone would make fudge the hard way. This is a small batch of fudge, because I cannot be trusted around a large batch. You know me. I press the fudge into a 6” round cake pan. It’s plenty of fudge without going over the top. You can double the recipe and press it into a 9″ regular cake pan, if you need more fudge in your life. 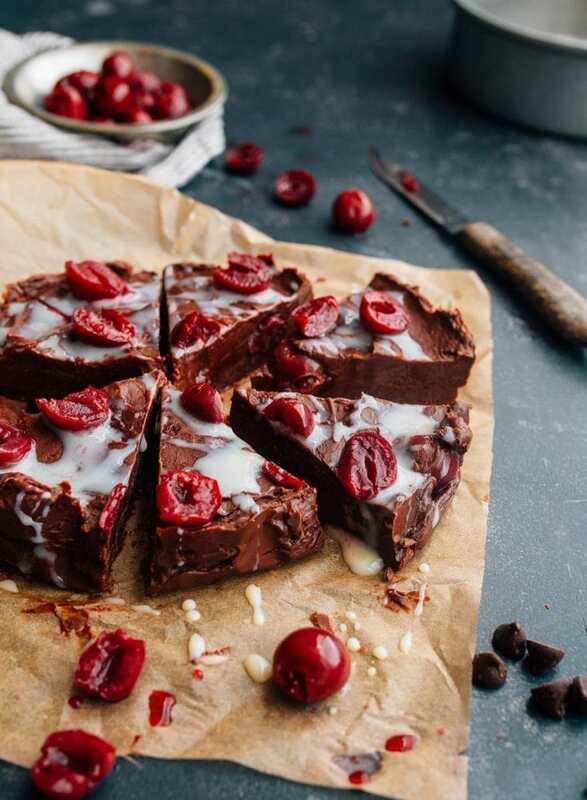 For this recipe, I spread half of the fudge in the pan, top with a layer of canned Morello cherries (my absolute favorite because they’re sweet with a touch of sour), and then spread the remaining fudge on top. 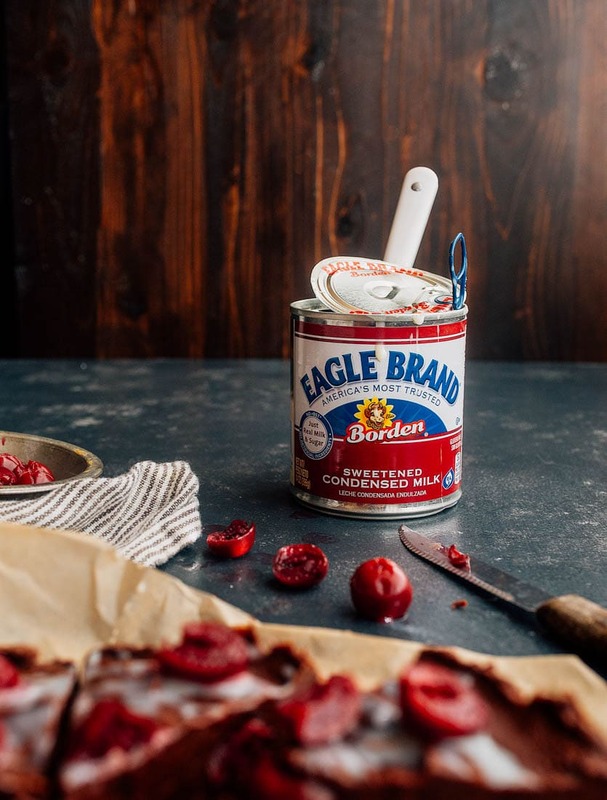 An extra drizzle of Eagle Brand Sweetened Condensed Milk on top really drives home the cherry cordial flavor. I can’t get enough. 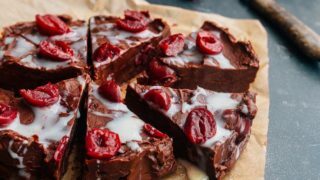 I hope you make and love this chocolate covered cherry fudge recipe this year! Happy uncookie exchange! Stay tuned for a very fun giveaway I’m hosting on instagram next week with Eagle Brand. It has a huge gift card to your favorite kitchen shop, plus fun baking tools! Also, check out my friend Julie Blanner’s peanut butter fudge! She inspired my recipe, and I love that her version only takes 10 minutes! Chocolate covered cherry fudge, a small batch fudge made in a 6" cake pan! Line a 6” round cake pan (or other similar small pan) with parchment paper. In a small saucepan over medium-low heat, add the sweetened condensed milk. Heat while stirring occasionally until small bubbles form on the edge of the pan. Do not boil. Have the chocolate chips ready in a small bowl. Pour the hot sweetened condensed milk on top of the chocolate chips, and let sit for 1 minute. Stir gently, and let rest for another 30 seconds or so. Meanwhile, slice the cherries in half and place them in a small bowl. Toss them with the almond extract (if using). At this point, the fudge should be completely homogeneous and melted. Pour half of the fudge into the parchment-lined pan. Press three-quarters of the cherries on top of the fudge. Drizzle about 2 tablespoons of sweetened condensed milk on top. Finally, pour the remaining fudge mixture on top of the cherries in the pan, and smooth the top. 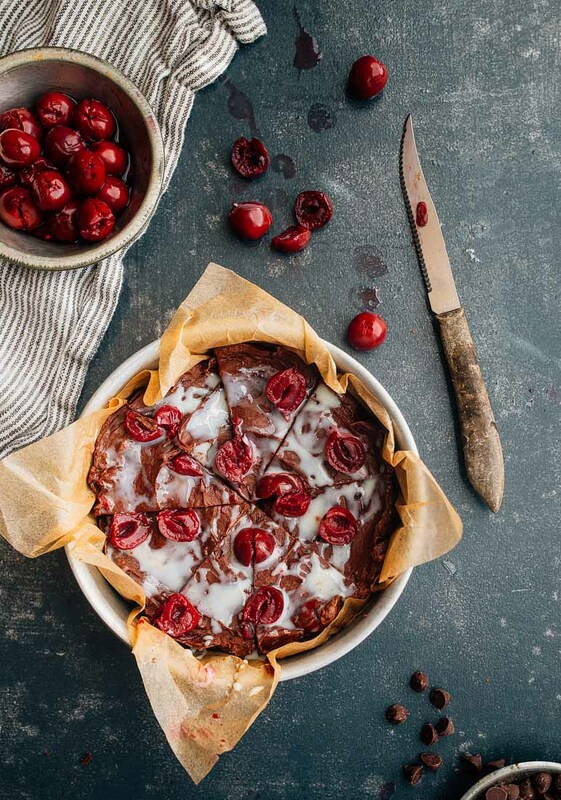 Decorate the top of fudge with the remaining cherries. Let the fudge set at room temperature for at least an hour, or set in the fridge for 30 minutes. Before serving, drizzle with an extra few tablespoons of sweetened condensed milk. Slice into 8 wedges, and serve. I also made a pumpkin pie just after Thanksgiving (didn’t get enough on the day itself). This looks AWESOME!!! I got some cherries from Trader Joe’s and I think they would be prefect in this! ???????????? I got some toffee macadamia nuts that I think would go perfect with this recipe. Im going to give it try as I’ve never made fudge in my entire life. Love your photos! almost completely forgot about fudge,making or eating it, until I saw this recipe, so thank you for the reminder and the recipe! Can hardly wait to make this one! Thanks for this recipe. I made this fudge yesterday and it never set. The center is soft and gooey. This has never happened to me before. Any ideas why this fudge didn’t firm up? I’m sorry this happened to you. Did you follow the directions? Did you use chocolate chips or a chopped chocolate bar? Did you use the fridge to firm it up? That should help, sorry! Is it possible that you live in a warm humid climate? YES, I LEARNED THE HARD WAY . DONT HEAT CONDENSED MILK, THINGS DONT SET RIGHT WHEN YOU DO, MELT THE CHOCOLATE, THEN POUR THE CONDENCED MILK OVER THE WARMED CHOCOLATE PENUT BUTTER OR WHATEVER YOU TRYING TO MAKE, THEN STIR IT IN AND PLACE IN A GREASED, LINED PAN TO FREEZE.